When we last reviewed eco-friendly Citiblocs, we gave them a big thumbs up. However, they only came in a basic natural wood color – not great for color-loving kids. 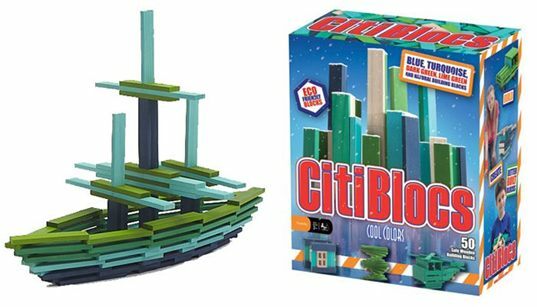 Now, just in time for the holiday season, Citiblocs has two new brightly colored sets of these fun building blocks. Like the original award winning Citiblocs, the new HOT and COOL color sets are made with natural wood and are perfect for little architects ages three-years and up. The new HOT color Citiblocs come in vibrant red, orange, yellow and pink while the new COOL color Citiblocs are in shades of turquoise, dark blue, light green and dark green. All colors are created with certified safe non-toxic water based stains. No glue, snaps or other tools needed. All your child needs to get building is his imagination. To aid in the building process a fun building guide with design ideas is included with each set. When we last reviewed eco-friendly Citiblocs, we gave them a big thumbs up. However, they only came in a basic natural wood color - not great for color-loving kids. Now, just in time for the holiday season, Citiblocs has two new brightly colored sets of these fun building blocks. Like the original award winning Citiblocs, the new HOT and COOL color sets are made with natural wood and are perfect for little architects ages three-years and up. The new HOT color Citiblocs come in vibrant red, orange, yellow and pink while the new COOL color Citiblocs are in shades of turquoise, dark blue, light green and dark green. All colors are created with certified safe non-toxic water based stains. No glue, snaps or other tools needed. All your child needs to get building is his imagination. To aid in the building process a fun building guide with design ideas is included with each set.